Ephemeris for Monday, May 14th. Today the Sun will be up for 14 hours and 47 minutes, setting at 9:03, and it will rise tomorrow at 6:14. The Moon, 1 day before new, will rise at 6:45 tomorrow morning. The Big Dipper points to other stars and constellations. 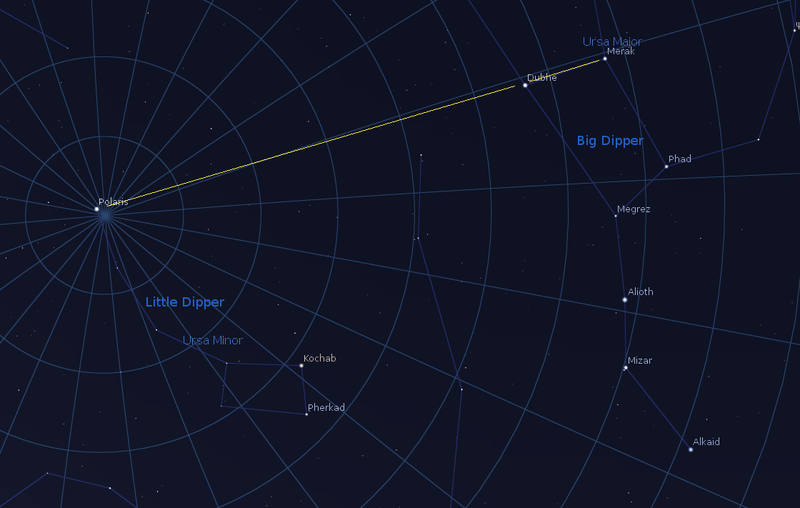 Right now the Big Dipper is nearly overhead. The front bowl stars point to Polaris, the North Star which never seems to move in the sky. The handle can be used to find two stars. First follow the arc of the handle away from the bowl to find the fourth brightest night-time star Arcturus in the base of the kite shaped constellation of Boötes. Straighten the arc to a spike and continue to the south and you will come to the bright blue-white star Spica in Virgo the virgin. You can remember these stars with the phrase “Follow the arc of the handle to Arcturus and then spike to Spica” or if you prefer the alternate pronunciation of the latter star “Speak to Speeka”. As can be seen below, there was one pointer function that didn’t make it into the program: A leaky dipper drips on Leo. Using the Big Dipper as a pointer to other stars. The pointers to Polaris could be life saving, since it is always north. The view is southward. The cross displayed near the center is the zenith. One might want to lay down to take all this in. Created using my LookingUp program. 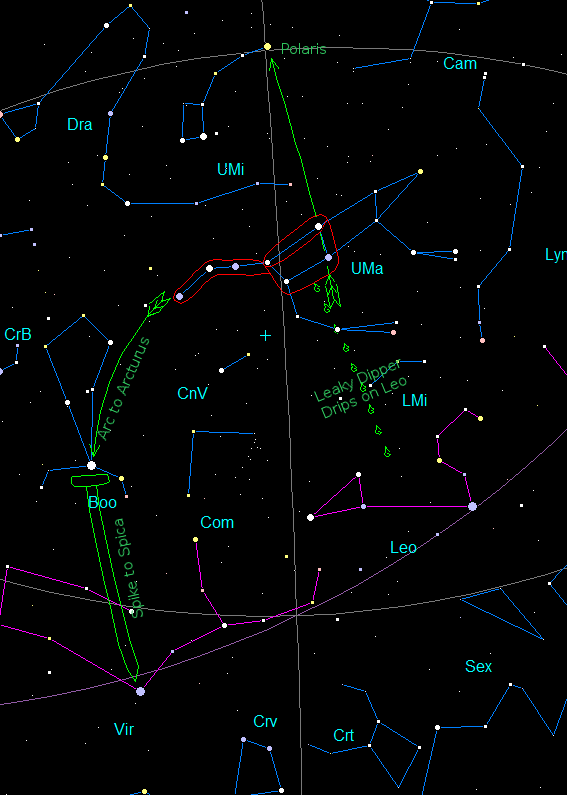 Ephemeris for Friday, March 27th. The Sun will rise at 7:33. It’ll be up for 12 hours and 30 minutes, setting at 8:03. The Moon, at first quarter today, will set at 3:49 tomorrow morning. Tonight we turn our eyes northward to Polaris, the North Star. It is the closest bright star to the north pole of the sky. It appears nearly stationary as all the other stars appear to revolve around it as the Earth rotates. Some folks, think that Polaris is the brightest star in the sky. It’s not. It is a good solid second magnitude star, about the brightness of a Big Dipper star. The Big Dipper can be used to point to it, by using the two stars at the front of the bowl. Polaris is at the end of the handle of the Little Dipper. The Little Dipper has four dim stars in its rather oddly bent handle and back of its bowl. The two stars at the front of the bowl of the Little Dipper are Kochab and the dimmer Pherkad, which are also called the Guard Stars or the Guardians of the Pole. 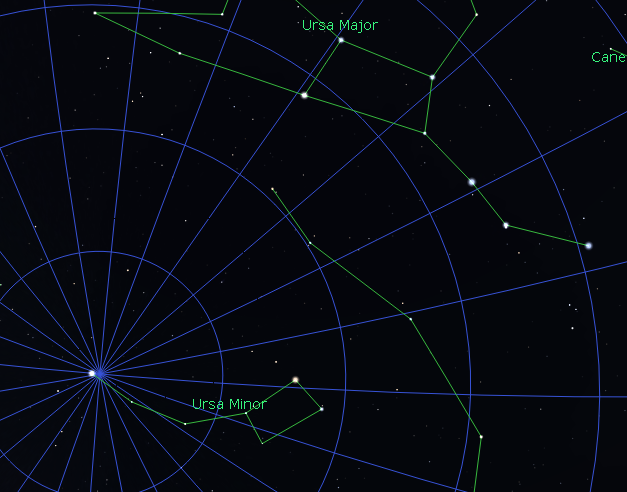 How to find Polaris. The grid is the equatorial grid showing the proximity to the pole. Created using Stellarium.